More information about the Angry Birds Card Game. 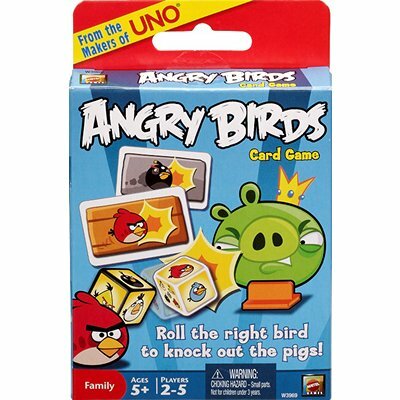 Angry Birds Card Game: From the makers of UNO comes a new card game based on the on the best-selling phone app game, Angry Birds. The survival of the Angry Birds is at stake. Be the first person to strategically topple the structure cards by rolling the right bird on the die. Then knock out the pigs with the flick of a die to win in this quick-play game. Includes Angry Birds playing cards and Dice. For 2 to 5 players ages 7+.